On Sept. 8, 2009, Gahagan’s physiotherapist informed the WSIB she was beginning an occupational rehabilitation program that would last for eight weeks. For the first five weeks, she would remain off work and for the rest of the program she could return to work gradually. • she should work three hours per day, three days per week with a rest day in between. The restaurant’s co-owner advised the WSIB specialist that this McDonald’s was a small restaurant with only 20 staff who couldn’t assist Gahagan with her duties. It was a fast-paced environment with no opportunity to rest, sit or take breaks, and he was concerned Gahagan would re-injure herself. The specialist wasn’t permitted to go behind the counter to survey the worksite because of liability concerns. The WSIB found the restaurant failed to co-operate in the return-to-work process and sponsored Gahagan for customer service job training and a labour market re-entry plan. At the completion of the plan in August 2011, Gahagan’s WSIB benefits ended. A month later, she applied for long-term disability (LTD) benefits with her insurer. Around the same time in September 2011, Gahagan filed a human rights complaint accusing the restaurant of discriminating against her by failing to participate in the return-to-work process in November 2009. Gahagan was approved for LTD benefits, but didn’t receive any because she was already receiving WSIB benefits. She also applied for and received a Canada Pension Plan (CPP) disability pension. Shortly thereafter, McDonald’s terminated her employment as of Oct. 3, 2011. Gahagan filed a second human rights complaint alleging McDonald’s failed to complete its statement for her LTD application and it unfairly terminated her employment — both constituting reprisals for her initial complaint. The limited space in the small restaurant kitchen didn’t allow for a chair to be placed for resting without raising health and safety concerns, and Gahagan’s physical limitations impeded her ability to do the grill assembly-line process, said the tribunal. Additionally, the only other possibilities were runner duties — not available at the small McDonald’s — or have a job shadow to assist her, something not possible with the small staff and fast pace. Even with the physiotherapist’s recommendation of three, three-hour days per week, Gahagan wouldn’t be able to perform her essential duties, said the tribunal. The tribunal noted the co-owner offered accommodation by having her work at a larger McDonald’s in nearby Peterborough, Ont., but Gahagan didn’t have a car to drive there. The tribunal dismissed Gahagan’s initial complaint that McDonald’s failed to accommodate her return-to-work efforts. The tribunal also found at the time of Gahagan’s termination, she hadn’t worked for nearly two-and-one-half years. The physical restrictions that she had in 2009 were still in place in 2011. 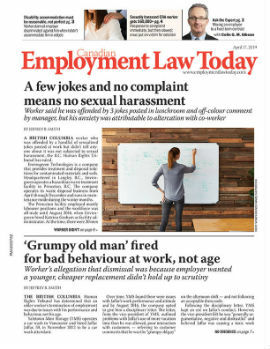 The fact she received LTD benefits and a CPP disability pension was telling, since both required “an inability to perform her job and a severe and prolonged disability” and pointed to the likelihood Gahagan couldn’t work without accommodation, said the tribunal. The restaurant claimed it had not completed the employer statement for Gahagan’s application for long-term disability benefits because it received notice of the application after her employment had been terminated. Though the restaurant was incorrect in its assumption that it didn’t have to fill it out, it corrected itself when it received a second application. There was no evidence supporting the claim McDonald’s intended to retaliate against Gahagan by delaying the filing of her long-term benefits application, said the tribunal. The tribunal found Gahagan failed to establish any discrimination or reprisal on the part of McDonald’s. The complaint was dismissed. • Gahagan v. James Campbell Inc, 2014 HRTO 14 (Ont. Human Rights Trib. ).